We kicked off the AAPA social calendar with our annual Fall Open House honoring Past Panhellenic Presidents on Sunday, November 6th at the Alpha Delta Pi International Headquarters in Atlanta, Georgia. With over 60 people in attendance, including nine AAPA Past Presidents, it was a great way to reconnect after the summer break. 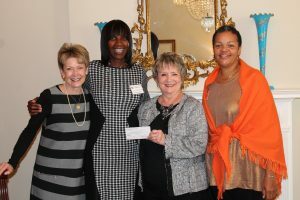 One of the highlights of the day was Rigby Duncan, Alpha Xi Delta and 2016-2017 AAPA President, presenting Lucy Hall, daughter of Mary Hall and founder of Mary Hall Freedom House, a check for $1,000.00 from AAPA. Lucy shared very inspirational words of how much it means to have “women supporting women”. The AAPA Fundraising committee kicked off their Shop for a Cause with Stella & Dot campaign featuring Stella & Dot’s gorgeous, brand new Fall & Holiday collections of jewelry and accessories with 15% of ALL sales donated to the AAPA Sisters for Scholars fund. Thank you to everyone who brought a dish to share. The food, as always, was delicious. Thank you, also, to our committee chair, Bonnie Pennington, Alpha Delta Pi, and her committee Anna Kate Sumler, Alpha Delta Pi, Karyn Angstadt, Alpha Omicron Pi, and Jessica Winkles, Phi Mu for hosting a wonderful event. Special thanks to Alpha Delta Pi for opening up their beautiful headquarters to us.